As I write this it is Thursday night, which means it is almost Friday. I am ready for the weekend as the kids have just been driving me nuts this week. I get it, they are all excited for the holidays and vacation time coming in a couple of weeks, and us nasty teachers are making them do work. :) Plus the sun popped out the last couple of days and I think they are as sun starved as I am. But oh, it is a challenge. So I have a journal page for Sheila's challenge over at Art Journal Journey. This month we are celebrating with a challenge titled Let's Celebrate. I stenciled some colorful fireworks. Then I painted and doodled the words and finally added some metallic sequins. And because my sequins have a bit of a twinkle to them, I am joining in with the Twinkle Twinkle challenge over at Try It On Tuesday. And I won a little package from Michelle over at Tag Tuesday that I thought I would share with you today. First there was this awesome tag. And then there was a nice little collection of some really fun stickers. 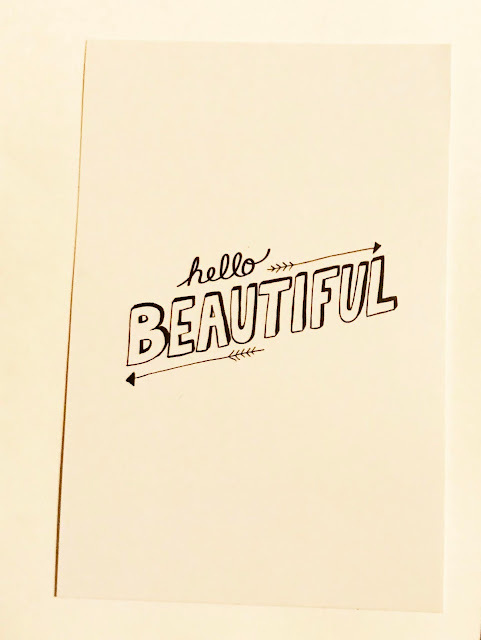 And there was also this postcard which also gives me a few ideas. Thanks Michelle for some great prizes. That certainly is a fun, celebration tag. Brought a smile to my face on Friday Eve. Looks like you got some cool goodies to play with. Can't wait to see what you do with them. Congratulations on your win at Tag Tuesday. Really great. I thought I had missed a day when I saw the title of your post. But now I realize you are simply ready to celebrate and it won't be long until the weekend is upon us. 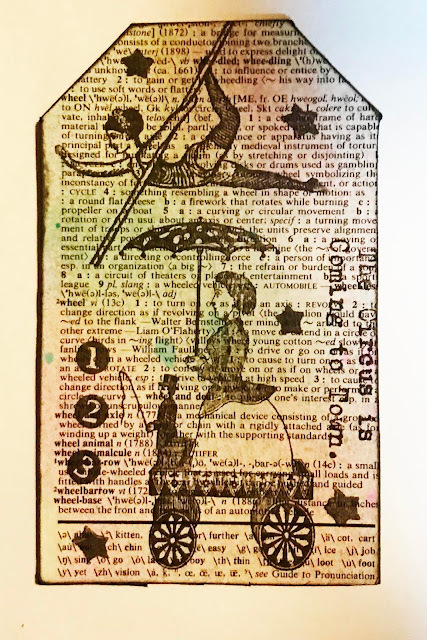 It's a great entry for Sheila's theme at Art Journal Journey. Thanks so much for sharing it because I am truly impressed with this entry. First of all - I am thrilled about the fireworks - what a fantastic idea and this page turned out so beautiful - I do love the addition of the metallic sequins - I am so happy to see this beautiful page linked not only to AJJ but also to TioT dear Erika! What a fabulous win you got from the talented Michele! I bet you will use all the goodies in a great way!Can't wait to see wat you will do with it. I can imagine how excited this pupils are and that it isn't easy to handle them! Good luck at work Mrs.Nelson! Happy weekend ahead - enjoy it and try to relax a bit! In a few exhausting days holidays are here - you will see! This is a great Celebrating piece, Erika, all swirls and sparkle and colours. I love the way you have done the splashy vibrant stencilling and the words, thanks very much for linking it to AJJ, much appreciated. 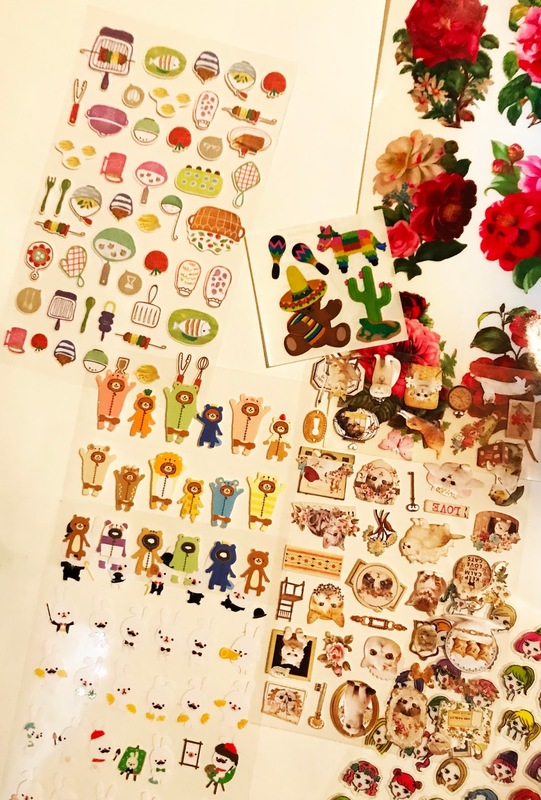 I can just imagine what fun you will have with these great stickers from Michelle. 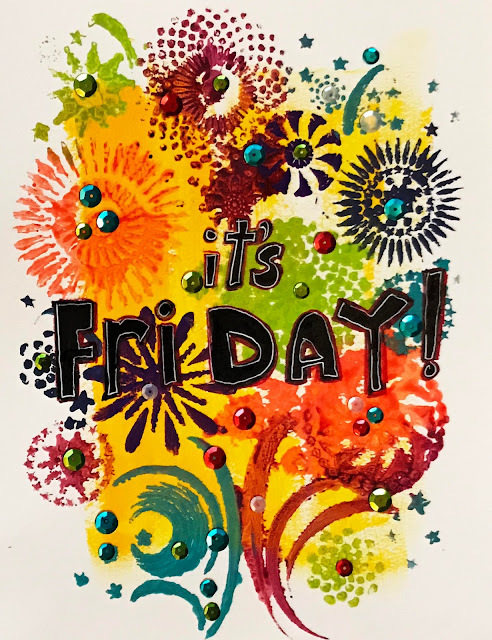 I can feel the excitement in your celebratory art :) Happy Friday! Its a fantastic, bright, happy page Erika, I love those twinkling sequins. Thank you for sharing the page with us at TioT's. Enjoy using your goodies, the stickers look cute..
Beautiful bright and colorful - your friday page is gorgeous! I like the addition of the metallic sequins! A fabulous page Erika, the stencilled fireworks are a brilliant idea peppered with the sparkly sequins.